Source: CICH graphic created using data adapted from Human Resources and Skills Development Canada. The National Shelter Study 2005-2009 – Highlights. https://www.canada.ca/content/dam/esdc-edsc/migration/documents/eng/communities/homelessness/reports/shelter_study.pdf – accessed July 18, 2017. 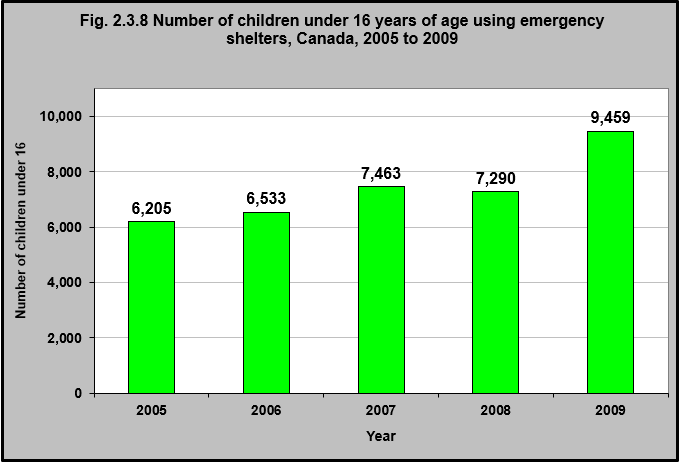 In 2009 there were over 9,400 children under 16 who stayed in emergency shelters in Canada. 1Human Resources and Skills Development Canada. The National Shelter Study 2005-2009 – Highlights. https://www.canada.ca/content/dam/esdc-edsc/migration/documents/eng/communities/homelessness/reports/shelter_study.pdf– accessed July 18, 2017.